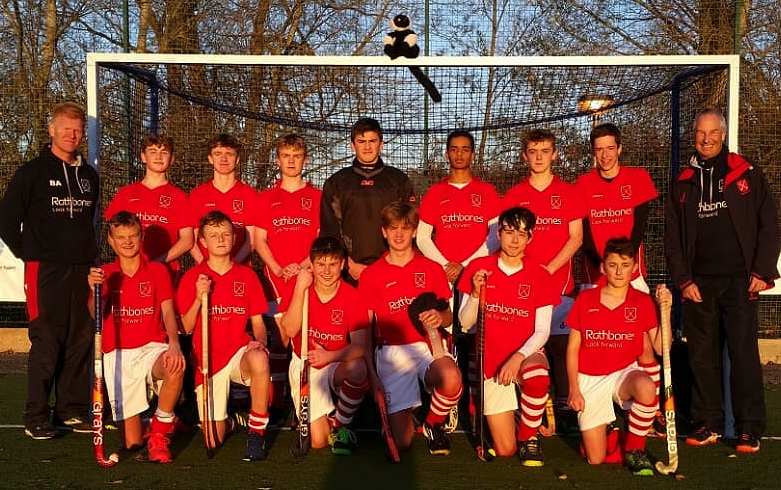 Jersey Hockey’s U16s Boys got off to a flying start with two impressive victories in the UK at the weekend. Travelling to Guilford HC, the boys won both of their matches, against Alton HC (6-0) and Guildford (2-1). The boys adjusted quickly to the water-based pitch, a surface on which most of the boys would never have played at this point in their hockey careers. In the first game, Jersey midfielder Aidan Boyle opened the scoring with a low reverse stick shot. Jersey were dominating play and three quick goals came just before half time. Liam Cadoret deflected in a first-time touch after good work by Mathew Jones and Dylan Kotedia which was swiftly followed by captain Robbie Forrest tapping in from close range from a short corner. Excellent interplay between Blake MacRae and Archie Corbett found Jones in the D and he skilfully lifted the ball over the advancing Alton keeper. In the second half the Jersey chances kept coming and from a well-worked short corner routine MacRae deftly deflected the ball in at the far post for Jersey’s fifth goal and the scoring was completed when Jones smashed a screamer into the roof of the Alton goal. After a short break, the Jersey boys then played Guildford, who had earlier beaten Alton 4-1. This was a much tougher game against a well-organised side. Midway through the first half Guildford took the lead when their star midfielder went on a long mazy run and unleashed an unstoppable shot high into Jersey goalkeeper Henry Dawson’s net. Jersey bounced back quickly and within five minutes were level when midfielder Chris Thomas’s strong shot was saved and Jones was on hand to slip home the equaliser. Chances came and went at both ends and the game was very tight. Halfway through the second period, Ethan Toudic and Corbett weaved through the Guildford defence with some smart interplay before Toudic guided the ball home, which turned out to be the winning goal. Two good wins and a good start to the campaign but next up is a big game against old foes Guernsey, on 20th January 2019 in Guernsey, which is a double-header as an England Hockey Championships match and the annual InterInsular, which Jersey will be looking to retain. “The boys rose to the challenge today playing against 2 sides who each played good hockey. Once we gathered our composure our guys played good hockey and I’m sure will have learnt lots from playing new oppositions. After ten minutes of Jersey dominance, midfielder Aidan Boyle opened the scoring with a low reverse stick shot. Jersey continued to create chances and short corners and three quick goals came just before half time. Liam Cadoret deflected in a first-time touch after good work by Mathew Jones and Dylan Kotedia which was swiftly followed by captain Robbie Forrest tapping in from close range from a short corner. Hard-working Blake MacRae won the ball in midfield and fed forward Archie Corbett and his excellent ball in to the Alton D was lifted over the diving keeper by Jones. The second half was more of the same with Alton creating few chances because of the hard work of the Jersey defence of Patrick Gouge, Ned Crosby, Oli Flemmer and Kotedia but when they did win a short corner, Jersey goalkeeper Henry Dawson easily saved their drag flick effort. The Jersey chances kept coming and from a well-worked short corner routine MacRae deftly deflected the ball in at the far post on his reverse for Jersey’s fifth goal and the scoring was completed when Jones smashed a screamer into the roof of the Alton goal. There was just time for Jersey attacker Ethan Toudic to repeat the feat but his effort beat the keeper but slammed into the crossbar. After a short break, the Jersey boys played Guildford, who had earlier beaten Alton 4-1. This was a much tougher game against a well-organised side. In Tier 2, this wasn’t Guildford’s first team at this age group but they were a useful side and the match was very even. Midway through the first half Guildford took the lead when their star midfielder went on a long mazy run and unleashed an unstoppable shot high into Dawson’s net. Jersey bounced back quickly and within five minutes were level when Jersey’s Chris Thomas’s strong shot was saved and Jones was on hand to slip home the equaliser. Chances came and went at both ends and the game was very tight. Halfway through the second period, Toudic and Corbett broke away and flummoxed the Guildford defence with some smart interplay around the whole Guildford defence before Toudic guided the ball home. This turned out to be the winning goal but Jersey had to safely see things out at the final whistle when Guildford were awarded a late short corner.